(Left to right) Phae Moore, mother of co-owner Brittany Moore; Assistant to the City Administrator Greg Minor; Councilmember Desley Brooks; co-owner Brittany Moore; co-owner Alphonso Blunt Jr.; and Alphonso's wife Kimberlee Blunt at the ribbon cutting for the dispensary's opening last week. Brittany Moore and Alphonso T. Blunt, Jr. set out to open a dispensary in Oakland that will represent and support the community they know and love. Last week, they achieved that goal. 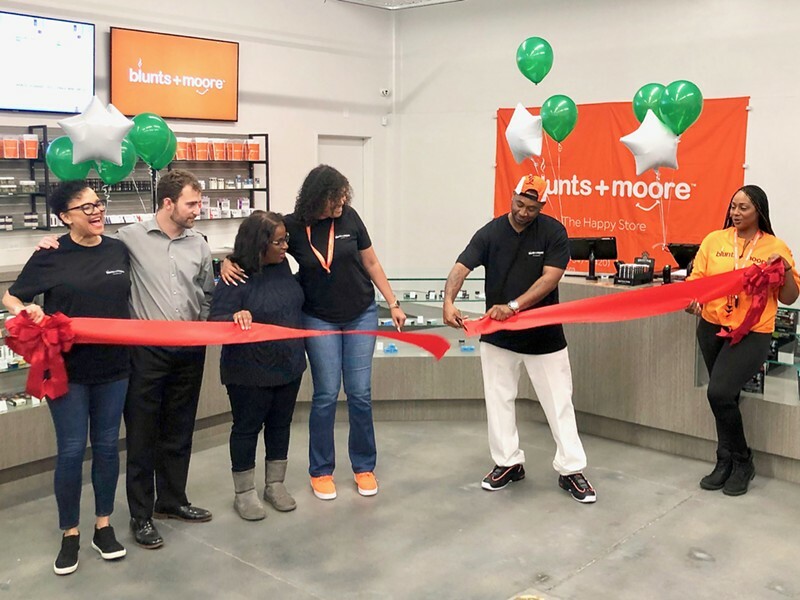 "This is a historic moment, literally," Brittany Moore told the assembled crowd after the ceremonial ribbon-cutting at the new East Oakland dispensary on 66th Avenue. "We're going to change the game for cannabis." Alphonso Blunt entered Oakland's equity permit program, which offers dispensary permits to longtime residents of areas of the city that were most impacted by the drug war or those convicted of a cannabis-related crimes in Oakland before legalization. Criteria for eligibility include a cannabis conviction in the last 22 years or 10-year residency in a neighborhood with disproportionate cannabis arrests and an income at 80 percent or less than the city's average. From the pool of applicants, four equity dispensary winners were chosen in a lottery in January, including Blunt. "It was exciting, nerve-wracking, and beautiful," Blunt said in an interview. "It really felt like winning the lottery"
Blunt is a fourth-generation Oaklander; he graduated from Frick Middle School and Castlemont High School. "Oakland means a lot to me," he said. "I'm hoping to help bring change to the city." Blunt is proud to employ Oaklanders and plans to do his part to help his community, he said. Opening his shop fulfills a longtime goal: to legally sell cannabis in the city he loves. "It feels amazing," Blunt said. "I'm humbled and hungry." The energy at the grand opening of the Blunts + Moore dispensary, located across from the Oracle Arena at 701 66th Ave., Ste. B, was one of triumph and excitement. Dozens assembled, browsing and admiring the clean, well-organized space. Green and white balloons hung off the tills, far below the high ceilings, and a DJ spun classic hip-hop. A food truck in the parking lot offered barbecue, and in between sporadic showers, Oakland residents jovially mingled in front of the shop. The cannabis equity program is an effort to diversify the industry and offset some of the damage of criminalization, which disproportionately impacted people of color. The city's equity ordinance, championed by outgoing Councilmember Desley Brooks, passed in 2016 as an acknowledgement of the harm done to communities of color and a promise to prioritize diversity within cannabis. The law, which states that half of all new permits must go to equity applicants, was implemented last year. "When you look at Alphonso's story, it speaks to why this program is so important," Brooks said in an interview. "Alphonso grew up at 80th and Holly, right down the street from here. All he wanted to do was legally sell cannabis, but couldn't because he was convicted while others weren't. He finally has hope and the opportunity to move forward." The vast majority of people convicted of cannabis-related crimes in Oakland are people of color, even though cannabis use tends to be more common among white people. According to a report from the Department of Race and Equity, in 2015 while only 30 percent of Oakland's population was African American, 77 percent of cannabis arrestees were. Oakland was the first city in the country to take steps to make cannabis more equitable, but has been joined by cities like San Francisco and Los Angeles. After the ribbon cutting, Blunt and Moore took a moment to thank Greg Minor, assistant city administrator, who has been involved in the equity program since its inception. "This is the first tangible representation of the equity program," Minor said. "Because the majority of cannabis businesses aren't open to the public, and the majority of equity dispensaries are still moving through the application process. This couldn't have happened without the hard work and effort of the city council, local businesses, and community advocates." After the ribbon cutting, Blunt thanked God, the people who supported him, and "Oakland, period." But the city benefits as much from Blunt's dispensary as he does, because the equity program supports more than just shop owners. "Ninety percent of their employees are Oakland residents," Brooks said. Blunts + Moore offers over 500 products, including flower, pre-rolls, edible, vapes, and CBD products. Thanks to a partnership with Grizzly Peak Farms, the dispensary will carry pesticide-free buds grown in Oakland. The 4,000-square-foot dispensary is open 10 a.m. to 7 p.m. daily. It features 10 checkout lines, plenty of parking, and grows some of its name-brand product on-site. Although three other equity dispensary permits were issued at the same time, Blunts + Moore is the first to open. The delay in implementation and perceived flaws in policy have led many to be critical of the program.